The largest of the 9 witnessed aubrite falls (enstatite achondrites). On 18 February 1948 the meteor fireball was seen over a large area. 7 stones were recovered. However, the largest mass (~1 ton) was not located until May. Virtually all of the original constituents of Norton County, like all aubrites, were formed in an utterly reducing environment, and as the largest aubrite — its mineralogy has been subject to intense scrutiny. Its chemical, mineralogical, and isotopic composition have been studied at all levels. Its pyroxene and sulfide components formed in an extremely reduced environment, especially, have been subject to intense scrutiny. Norton County, like most aubrite falls, has experienced extensive brecciation followed by uneven re-equilibration with quite variable shock levels in both olivine (S1-S4) and enstatite (S1-S3). A caveat. 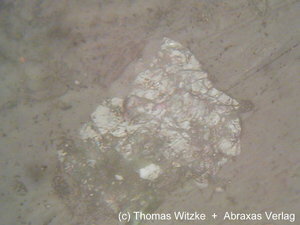 Gypsum, manganite, some carbonates and two new minerals (cronusite and schöllhornite) appear to be products of the large mass's 3 month exposure to 'the elements', i.e. weathering products. 26 valid minerals. 4 (TL) - type locality of valid minerals. Reference: Am Min 67:132-136; Klaus Keil, Kurt Fredriksson (1963) Electron microprobe analysis of some rare minerals in the Norton County achondrite. Geochimica et Cosmochimica Acta Volume 27, Issue 9, September 1963, Pages 939–942; Watters, T. R. & Prinz, M (1979) Aubrites - Their origin and relationship to enstatite chondrites. In: Lunar and Planetary Science Conference, 10th, Houston, Tex., March 19-23, 1979, Proceedings. Volume 1. (A80-23557 08-91) New York, Pergamon Press, Inc., 1979, p. 1073-1093.; Okada, A., Keil, K., Leonard, B. F., & Hutcheon, I. D. (1984). Schöllhornite, Na0. 3 (H2O) 1 [CrS2] a New Mineral in the Norton County Enstatite Achondrite. Meteoritics, 19, 284. Reference: Watters, T. R. & Prinz, M (1979) Aubrites - Their origin and relationship to enstatite chondrites. In: Lunar and Planetary Science Conference, 10th, Houston, Tex., March 19-23, 1979, Proceedings. Volume 1. (A80-23557 08-91) New York, Pergamon Press, Inc., 1979, p. 1073-1093. Reference: Lionel Wilson & Klaus Keil (1991). 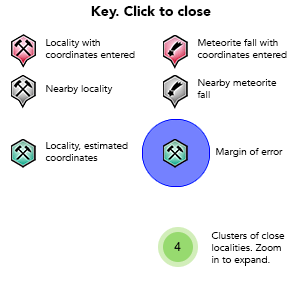 Consequences of explosive eruptions on small solar system bodies - The case of the missing basalts on the aubrite parent body. Earth and Planetary Science Letters, vol. 104, no. 2-4, 505-512. Reference: Meteoritical Society Database; Okada, A., Keil, K., Leonard, B. F., & Hutcheon, I. D. (1984). Schöllhornite, Na0. 3 (H2O) 1 [CrS2] a New Mineral in the Norton County Enstatite Achondrite. Meteoritics, 19, 284. Reference: Shkurenko, K. O.; Semenenko, V. P.; Gorovenko, T. M.; Slyvinsky, V. M. (2011). Fine Morphological Features of Mineral Grains in the Norton County Aubrite. Meteoritics & Planetary Science 46, Supplement, A212. Reference: Am Min 67:132-136; Okada, A., Keil, K., Leonard, B. F., & Hutcheon, I. D. (1984). Schöllhornite, Na0. 3 (H2O) 1 [CrS2] a New Mineral in the Norton County Enstatite Achondrite. Meteoritics, 19, 284. Reference: Akihiko Okada, Klaus Keil & G. J. Taylor (1980). The Norton County enstatite achondrite: A brecciated, plutonic igneous rock. Abstracts of Papers Presented at the Forty-Third Annual Meeting of the Meteoritical Society. LPI Contribution 412, edited by Paula Criswell, published by the Lunar and Planetary Institute: Houston, p.170. Reference: Klaus Keil, Kurt Fredriksson (1963) Electron microprobe analysis of some rare minerals in the Norton County achondrite. Geochimica et Cosmochimica Acta Volume 27, Issue 9, September 1963, Pages 939–942; Watters, T. R. & Prinz, M (1979) Aubrites - Their origin and relationship to enstatite chondrites. In: Lunar and Planetary Science Conference, 10th, Houston, Tex., March 19-23, 1979, Proceedings. Volume 1. (A80-23557 08-91) New York, Pergamon Press, Inc., 1979, p. 1073-1093. Reference: Am Min 67:132-136; Klaus Keil, Kurt Fredriksson (1963) Electron microprobe analysis of some rare minerals in the Norton County achondrite. Geochimica et Cosmochimica Acta Volume 27, Issue 9, September 1963, Pages 939–942; Watters, T. R. & Prinz, M (1979) Aubrites - Their origin and relationship to enstatite chondrites. In: Lunar and Planetary Science Conference, 10th, Houston, Tex., March 19-23, 1979, Proceedings. Volume 1. (A80-23557 08-91) New York, Pergamon Press, Inc., 1979, p. 1073-1093. 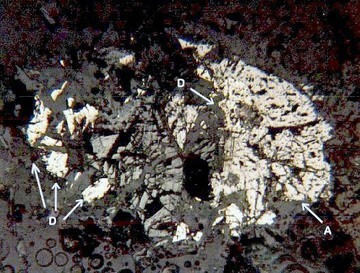 Description: Olivine composition (Fa0.01) corresponds to nearly pure forsterite. Reference: Klaus Keil, Kurt Fredriksson (1963) Electron microprobe analysis of some rare minerals in the Norton County achondrite. Geochimica et Cosmochimica Acta Volume 27, Issue 9, September 1963, Pages 939–942; Watters, T. R. & Prinz, M (1979) Aubrites - Their origin and relationship to enstatite chondrites. In: Lunar and Planetary Science Conference, 10th, Houston, Tex., March 19-23, 1979, Proceedings. Volume 1. (A80-23557 08-91) New York, Pergamon Press, Inc., 1979, p. 1073-1093.; Rubin, A. E. (2015). Shock and annealing in aubrites: Implications for parent-body history. Meteoritics & Planetary Science 50(7): 1217-1227. (July 2014). Reference: Am Min 67:132-136; Klaus Keil, Kurt Fredriksson (1963) Electron microprobe analysis of some rare minerals in the Norton County achondrite. Geochimica et Cosmochimica Acta Volume 27, Issue 9, September 1963, Pages 939–942; Okada, A., Keil, K., Leonard, B. F., & Hutcheon, I. D. (1984). Schöllhornite, Na0. 3 (H2O) 1 [CrS2] a New Mineral in the Norton County Enstatite Achondrite. Meteoritics, 19, 284. Reference: Lunar and Planetary Science XXXII (2001); Okada, A., Keil, K., Leonard, B. F., & Hutcheon, I. D. (1984). Schöllhornite, Na0. 3 (H2O) 1 [CrS2] a New Mineral in the Norton County Enstatite Achondrite. Meteoritics, 19, 284. Reference: Am Min 67:132-136; Watters, T. R. & Prinz, M (1979) Aubrites - Their origin and relationship to enstatite chondrites. In: Lunar and Planetary Science Conference, 10th, Houston, Tex., March 19-23, 1979, Proceedings. Volume 1. (A80-23557 08-91) New York, Pergamon Press, Inc., 1979, p. 1073-1093.; Okada, A., Keil, K., Leonard, B. F., & Hutcheon, I. D. (1984). Schöllhornite, Na0. 3 (H2O) 1 [CrS2] a New Mineral in the Norton County Enstatite Achondrite. Meteoritics, 19, 284. Reference: Amer.Min. (1985) 70, 638-643; Okada, A., Keil, K., Leonard, B. F., & Hutcheon, I. D. (1984). Schöllhornite, Na0. 3 (H2O) 1 [CrS2] a New Mineral in the Norton County Enstatite Achondrite. Meteoritics, 19, 284. Reference: Mittlefehldt, D. W., McCoy, T. J., Goodrich, C. A. & Kracher, A. 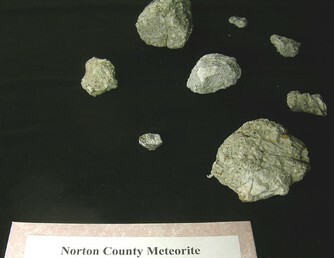 (1998) Non-chondritic meteorites from Asteroidal bodies. In: Planetary Materials (Papike, J. J., Editor): Chapter 4, 195 pages. Mineralogical Society of America: Washington, DC, USA. Comments: approximate thickness 0-50 ft. in outcrop Original map source: Ross, Jorgina A., 1992, A digital representation of the Geological map of Kansas: Kansas Geological Survey, Map M-23, scale 1:500,000. F. C. Leonard (1946). The Furnas County stone of the Norton County, Kansas-Furnas County Nebraska, achondritic fall. Popular Astronomy, Vol. 56, pp.434-436. Klaus Keil, Kurt Fredriksson (1963) Electron microprobe analysis of some rare minerals in the Norton County achondrite. Geochimica et Cosmochimica Acta Volume 27, Issue 9, September 1963, Pages 939–942. Okada, A., Keil, K., Leonard, B. F., & Hutcheon, I. D. (1984). Schöllhornite, Na0. 3 (H2O) 1 [CrS2] a New Mineral in the Norton County Enstatite Achondrite. Meteoritics, 19, 284. Mittlefehldt, D. W., McCoy, T. J., Goodrich, C. A. & Kracher, A. (1998) Non-chondritic meteorites from Asteroidal bodies. In: Planetary Materials (Papike, J. J., Editor): Chapter 4, 195 pages. Mineralogical Society of America: Washington, DC, USA. Keil, K. (2010) Enstatite achondrite meteorites (aubrites) and the histories of their asteroidal parent bodies: Chemie der Erde : Beiträge zur chemischen Mineralogie, Petrographie und Geologie. 70, no. 4, (2010): 295-317.